I will continue to follow-up with an article about the retail market. In my recent articles I have had a focus on retailer stocks like Alibaba, Kohl`s and J C Penny. Some of them are plummeting, but others are skyrocketing. 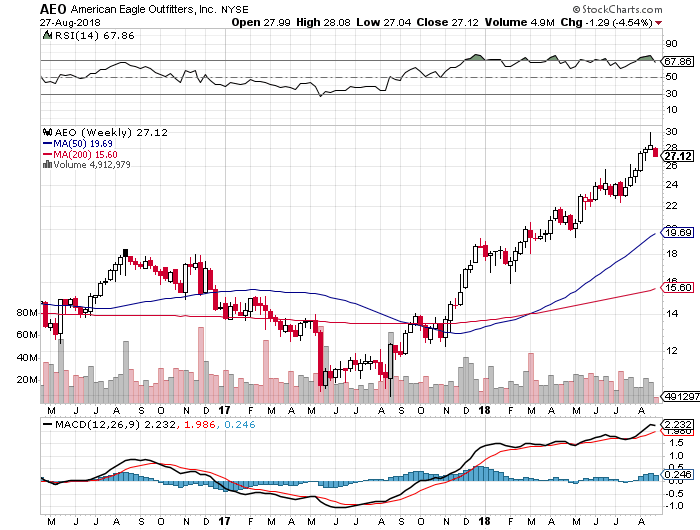 Take a look at American Eagle Outfitters (AEO). The stock has gone from $10 to nearly $30 in just 12 months, but now, like other successful retailers, it seems like the bulls would take a break for a while. The stock hit a 10-year high of $29,88 last week. AEO is set to report earnings before the open on Wednesday, August 29, and analysts are beginning to be skeptical to this equity right now. Wedbush just lowered its AEO rating to «neutral» from «outperform,» saying it`s moving to the sidelines with the stock near its $29 price target. The brokerage firm suggested that L Brands recent struggles could give AEO a chance to gain market share, which may mean more promotional activity in the near term. But bearish sentiment is building elsewhere. The unemployment rate is low and the wages is increasing a little bit. But the new wave of consumer spending isn`t enough to justify a $30 share price for AEO at the moment. Wall Street analysts are expecting sales to increase 10,12 percent compared to the prior year quarter. AEO is also expected to report a $930 million jump. Expected profit is $1,52 per share compared to profit of $1,16 per share last year. A full-year revenue last year came in at $3,80 billion, while analysts estimate a full-year revenue to be $3,97 billion this time on average. President Donald Trump made a new trade deal with Mexico today. That deal will be good for AEO that opened the first store in Mexico City at Fashion Mall Perisur on February 20, 2013 and at Centro Santa Fe on June. Not only that. President Donald Trump slashed the tax which is helping AEO a lot. So does a stronger dollar. Just look at the numbers. Diluted EPS is up 57,14 percent. Net profit margin; +46,53 percent. Net income; +58,22 percent, and revenue +8,02 percent YoY. Not bad for a company with a $5 billion market cap. The stock declined -$4,57 percent on Monday, and you can clearly see that investors are taking profit from this growth stock. By 2021, AEO`s earnings can reach $285 million, from current levels of $204 million. An annual growth rate of about 8 percent. A share price above $30 would be overvalued, and the current share price of AEO is above its future cash flow value of $22,77. American Eagle Outfitters Inc is expected to report earnings on August 29, 2018 before market open. The report will be for the fiscal Quarter ending July 2018. The consensus EPS forecast for the quarter is $0,31 versus $0,19 for the same quarter last year.